As anyone who has ever watched Antiques Roadshow can attest, the surest way to utterly destroy an antique’s value is to “restore” it, to make it look like new. Sadly, this is exactly what Randy Shaw has done with several of the Tenderloin’s lovely old, faded building ads, defacing their intrinsic beauty and nullifying their historicity. Nice work, Mr. Shaw. There is a big difference between old building ads and contemporary murals, a difference you clearly don’t comprehend. If you don’t want to take my word for it, I strongly suggest you consult knowledgable art historians before running off half-cocked and ruining any more neighborhood treasures. 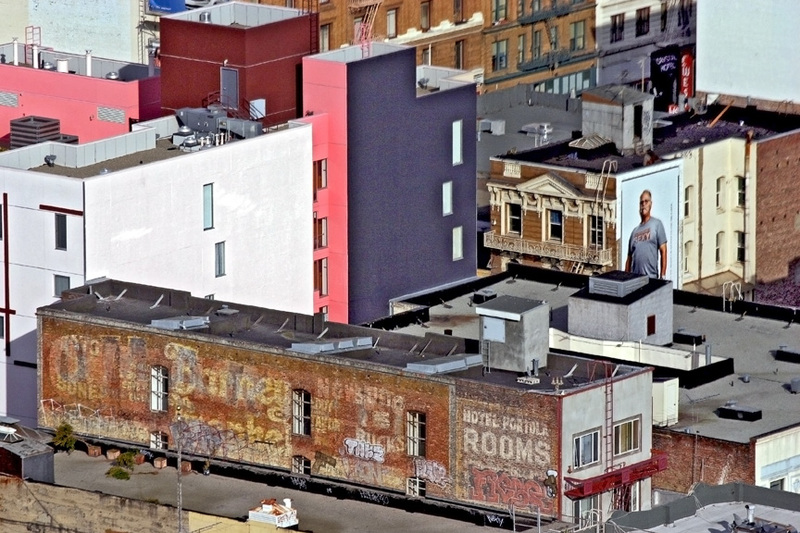 Funded by a thirty-five thousand dollar Community Challenge grant overseen by Shaw’s Tenderloin Housing Clinic, which manages the City’s master lease SROs — arguably some of the worst-run residential hotels in San Francisco — the supposed restoration was carried out by Mission District muralists Precita Eyes. Adept at Byzantine maneuvering of both neighborhood and City Hall politics to serve his own ends, Shaw wants to attract affluent tourists to the neighborhood and is currently planning a Tenderloin history museum. The building ads seen here have thus far been untouched. Let us hope they remain so. I agree 100% with the Tender on the repainting of old murals. I live at the William Penn on Eddy Street, and have a straight full view of th e Original Joes/Coca Cola Mural that was meticulously painted over. An “A” for detail, an “F” for awareness/sensitivity. Tsk tsk.